Obituary – Kretsch, Arthur « Perry High School Alumni Association, Inc.
Services will be at 2 p.m. Wednesday for Arthur Kretsch, Enid, 66, formerly of Perry, who died Monday in an Enid hospital following a brief illness. Services will be at the Hen­ninger-Allen funeral home chapel, Enid. Dr. Leslie G. Eferitt will officiate. Burial will be at Memorial Park cemetery, Enid. Kretsch was the son of the late Fred Kretsch, who former­ly was mayor of Perry and who operated a retail business on the west side of the square until the mid-1940s. Kretsch was born May 1, 1908 at Perry. 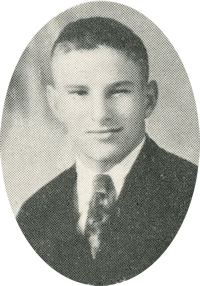 He attended Perry schools and graduated from Perry high school in 1927. He at­tended Oklahoma A&M college. He worked at the Perry Drug store 13 years before entering the Navy Aug. 19, 1943. He was in the medical corps, and served one year in Guam. After being discharged from the Navy in 1945, he moved to Enid, where he worked for San­ford-Stunkle Drug store until they quit business in 1968. He then worked at Zaloudek’s until his illness. He was married Feb. 1, 1933, at Perry to the former Eleanor Morgan, who survives. He was a member of the American Legion and attended the First Presbyterian church. In addition to his wife, of the home, he is survived by one sister, Miss Charlotte Kretsch, Enid. Memorial contributions in Kretsch’s name may be made to the Oklahoma Medical Research Foundation, cancer division. Henninger-Allen fu­neral home will be receiving agent.